Planting a Seedlings for Schools garden at Littlewood Elementary, Gainesville. The program’s wildflower gardens provide a tool with which teachers can help children learn about pollinators, make scientific observations, spur creativity and much more. When applicable, teachers are urged to pair the gardens with the Foundation’s Wild About Wildflowers! Activity Guide for third- and fourth-graders, available via free download from its website. Activities and lessons in the guide are correlated to New Sunshine State Standards in language arts, math and science. Jose Marti MAST Middle School, Hialeah, will add its wildflowers to an arboretum holding more than 40 Florida native plants. The Green Team at Deerwood Elementary School, Orlando, will blog about the garden to keep everyone abreast of its progress. 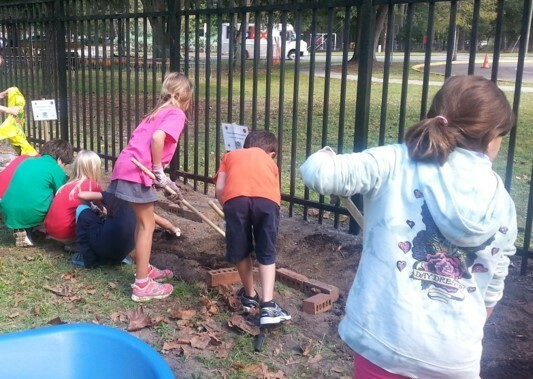 Burns Science & Technology Charter School, Oak Hill, will expand its wildflower garden (planted with a 2016 Seedlings for Schools grant), which won the Florida Department of Agriculture & Consumer Services’ Golden Shovel Award in 2016 with the help of the Florida Native Plant Society’s Pawpaw Chapter. Horizon Middle School, Kissimmee, will partner with the YMCA Afterschool Program to care for its garden, while Sabal Palm Elementary in North Miami Beach will partner with Oleta River State Park. Master Gardeners and a local landscape company will help Parkway Middle School, Lauderhill, add its wildflowers to a courtyard dedicated to its STEM Horticulture Class. The Sarasota Garden Club will lend a hand at Alta Vista Elementary School, while the Plantation Garden Club will assist Seminole Middle School, Plantation. Teachers are enthusiastic and look forward to using wildflowers as teaching tools during hands-on nature lessons. Consider volunteering at a Seedlings for Schools garden near you!